Street Quads. Fastest Growing ATV Class in Europe.Coming to the USA? ATVs designed from the ground up to be street quads are growing in popularity in countries that have street legal 4 wheelers. 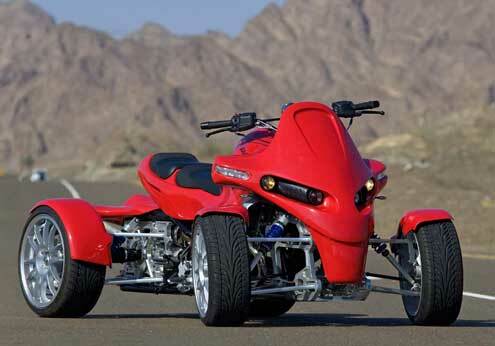 We in the USA can only fantasize about street ATVs but that won't stop us from taking a look at them. These are some of the current offerings from around the world. We'll start with a familiar name - Polaris. 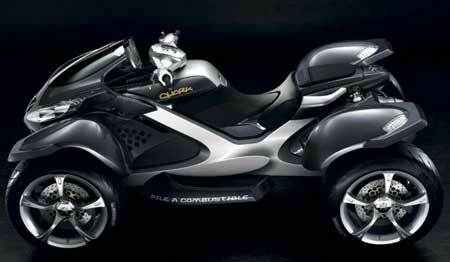 This Revolver concept street quad was shown several years ago. Latest word is that there are no immediate plans to produce it. It does show that Polaris was serious about this type of ATV though. Polaris Revolver street legal ATV concept. This is a Yamaha Raptor believe it or not. Heavily modded sport ATVs are the latest rage in Europe. Several shops have begun to specialize in conversions and develop high performance parts for these hybrids. Yamaha Raptor modified for street use in Europe. 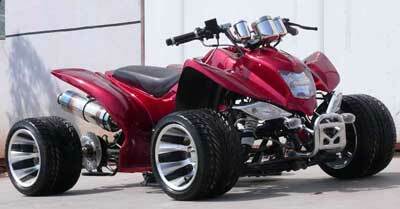 ATV street tires, front and rear sway bars, bigger brakes, and all the go-fast engine goodies you can imagine. Then you have the ultra high performance, scratch built specials from small manufacturers. The GG Quad is a standout in that group. A 1200cc BMW engine and drive train motivate the GG down the road at pretty alarming speed! Speaking of alarming - the over $50,000 price tag will keep this one on most of our fantasy lists. It's actually available in a few states that allow street legal quads! 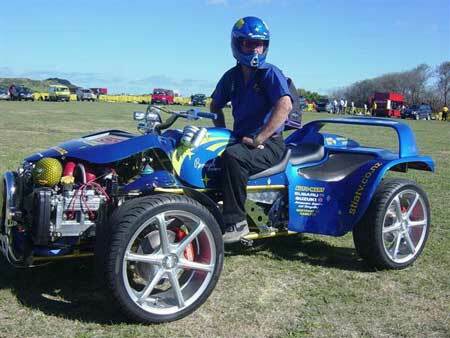 Subaru STI based street legal quad in New Zealand. Wow!!! I don't know what to say. Some mentally unstable Kiwis must have bumped their heads when they wrecked their Subaru STI. I'm guessing this is the result of a heavy night of drinking Fosters. Nothing like sitting on top of a 450 hp car to sober you up! Actually this is the most creative use of a totaled car I have ever seen. Since you have a VIN number to start with, you might have a shot at getting something like this licensed as a kit car. That doesn't mean you should, but just maybe you could. The Cectek Quadrift all wheel drive quad for the street! 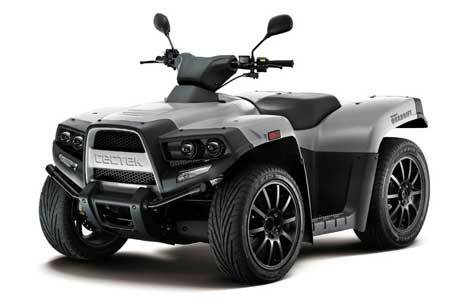 The Cectek Quadrift comes from a Taiwan company bringing four wheel drive to street quads. The company says it's intended to be used on the street only. Thus the lower center of gravity and street radial tires. It sports a 500cc liquid cooled and fuel injected single cylinder engine. Chinese companies are serious about street legal ATVs! This is a new Chinese entry into the world of street quads. 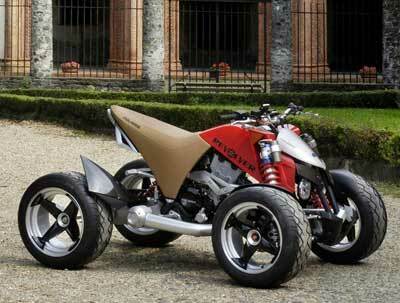 It has a very Italian looking design and demonstrates the growing commitment to this type of ATV. Not a lot of specs available other than an 800cc 3 cylinder engine with fuel injection and liquid cooling. I like it! So that's pretty much what's happening with street legal quads right now. We have learned from our European sources that accident statistics from regular ATVs operating as street legal quads is causing many manufacturers to take a serious look at purpose built street quads. That could end up being good for all of us that dream of being able to ride street legal ATVs. A four wheeler with a high center of gravity, narrow track width, balloon tires, locked differential, and small brakes, is probably not the best choice for a street machine. Return to Street Legal ATV Guide from Street Quads.